Have I mentioned before that I love peanut butter? Well, I do. The other day I was craving the combination of peanut butter and chocolate (again!) so I decided to make peanut butter brownies. I used a recipe from Epicurious as my guide for this experiment, and I must say this dessert turned out very yummy. These brownies had the perfect balance of peanut butter and chocolate goodness. The peanut butter was not overpowering. The brownies sank a little in the middle after I took them out of the oven, but I only used ¼ teaspoon of xanthan gum when I made them. In the recipe below I’ve changed that amount to ½ teaspoon. This extra xanthan gum should deal with some of the sinking problem. I love using chopped semisweet chocolate in this recipe. If you don’t have any nice semisweet chocolate, chocolate chips could also work. 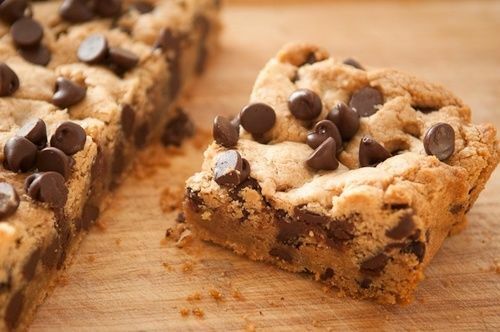 These brownies look more like blondies, because of their tan color, and not brownies, but you can definitely taste the chocolate. Preheat oven to 350°F. Butter and flour (I used rice flour) an 8-inch square baking pan. In a medium bowl, mix flours, xanthan gum, baking powder and salt. Set aside. In a large bowl, beat butter with a mixer until smooth. Add peanut butter to butter; beat until well blended. Scrape down sides of the bowl occasionally. Beat in brown sugar. Add eggs 1 at a time, beating well after each egg is added. Beat in vanilla. Add flour mixture to peanut butter mixture; beat until blended. Stir in chocolate. Transfer batter to pan. Using spatula, smooth top. Bake until toothpick inserted 2 inches from edge of pan comes out with moist crumbs attached, about 33-35 minutes. Transfer pan to rack and cool completely. Cut brownies into squares and serve. Of course they’re even better with ice cream. Why is peanut butter so good?